Allen Vandever & Team ART! The Chicago Art’s District showPODs are stretched to their limit and beyond by Allen Vandever & Team ART!. While Allen fills seven spaces, four of the showPODs are in collaboration with four different artists. Allen uses the space by incorporating the windows, the wall, and the space in between. From creating a 3D effect (when you stand in the right spot) with Zore Sixtyfour to the mixing of styles with Jason Davis as their paintings merge together on the wall. 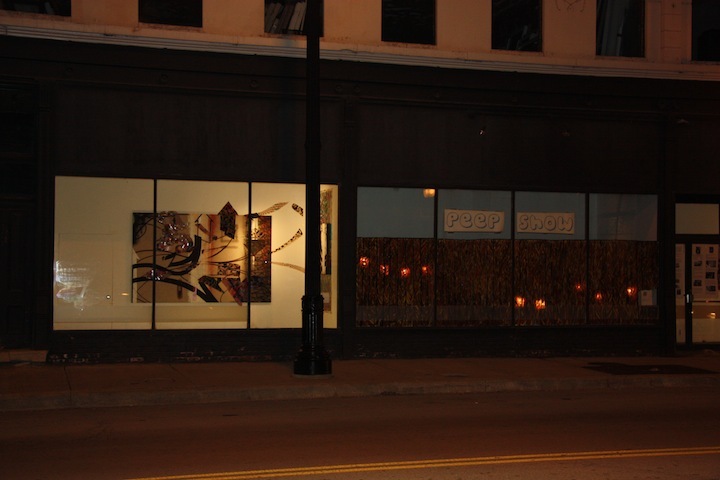 Naqee’s paintings surround Allen’s the last the POD and, not to mention, the “Peep Show”, which was in collaboration with Joanna Przybylak. Needless to say, there will be plenty of surprises in store for the viewer. One can see the work anytime, day or night, through to the end of April, but the best time to visit is when the Chicago Arts District has their “2nd FRIDAYS Gallery Night”. The showPOD’s are located on South Halsted and 18th Street. 2nd FRIDAYS reception begins at 6:00PM to 10:00PM on April 12th. The event is free of charge.